The study was supported with funding from the National Science Foundation (grants 1232442 and 1319293). The VWR Foundation, U.S. Forest Service, North Carolina Museum of Natural Sciences and Smithsonian Institution also contributed to the work. Abstract: 1. Interspecific interactions can provoke temporal and spatial avoidance, ultimately affecting population densities and spatial distribution patterns. The ability (or inability) of species to coexist has consequences for diversity and ultimately ecosystem stability. Urbanization is predicted to change species interactions but its relative impact is not well known. Urbanization gradients offer the opportunity to evaluate the effect of humans on species interactions by comparing community dynamics across levels of disturbance. 2. 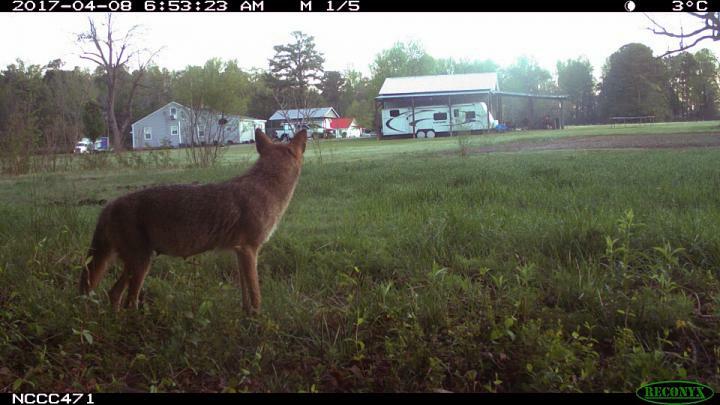 We used camera traps deployed by citizen scientists to survey mammals along urbanization gradients of two cities (Washington, DC and Raleigh, NC, USA). We used a multispecies occupancy model with four competing predator species to test whether forest fragmentation, interspecific interactions, humans or prey had the greatest influence on carnivore distribution. 3. Our study produced 6,413 carnivore detections from 1,260 sites in two cities, sampling both private and public lands. All species used all levels of the urbanization gradient to a similar extent, but co-occurrence of urban-adapted foxes with less urban-adapted bobcats and coyotes was dependent on the availability of green space, especially as urbanization increased. This suggests green space allows less urban-adapted species to occupy suburban areas, but focuses their movements through remaining forest patches, leading to more species interactions. 4. Synthesis and applications. Species interactions, forest fragmentation and human-related covariates were important determinants of carnivore occupancy across a gradient of urbanization with the relative importance of forest fragmentation being highest. We found evidence of both positive and negative interactions across the gradient with some dependent on available green space, suggesting that fragmentation leads to higher levels of spatial interaction. Where green space is adequate, there appears to be sufficient opportunity for coexistence between carnivore species in an urban landscape.